Wow.. many thanks to Richard! Sorry I did go there and I apologise! There’s an unnecessary U on that cover – and an unnecessary ewe! Bah-dum-tish! Excellent blog, made me laugh. If you ever fancy doing a guest blog on bad covers for the Feckless Goblin, let me know!!! Inspired by THE MARTIAN CHRONICULES, I suppose. That is one bad title, and one baa-aaa-aad cover. Actually, I thought it was quite good until I saw the sheep. That’s when the coffee went up my nose and all over my computer screen. Science Fiction. A mysterious explosion, a haunting indefinable smell. Sitting quietly by a Cornish creek, reading his favorite comic book, Roses Varco hears the bang, catches a trace of the odor – and understands nothing. Which is hardly surprising, since Roses has just witnessed the death of a time-traveler lost in a limbo between worlds. Had he known the truth, it would have terrified him – for that traveler was himself. 206 Pages. I tell you what my first thought was. My first thought was that there was a breast under there, and you’d stuck a sticker of a sheep over it to spare our delicate sensibilities. But then I looked again and saw that the sheep is indeed integral to the design. Then I rubbed my eyes and looked again. And the publisher is Arrow! Shouldn’t it be Baa-aa-aen? One hell of a bluetooth ear piece. At first glance this cover looks kind of cool. Then…what the crap, is that a cyborg sheep? Really does sound like a fun story, I’ll have to look for this one. Ok ok.. I just can’t get it out of my head now..
Oh NWA… I probably could have been killed for a comment like that back in the early 90’s! Extreme acupuncture and body amputation is a well-known cure for the chronicules. The sheep is necessary to keep his neck warm. Why is the guy looking up? Is the horned sheep spaceship nothing compared to the coffee stained space? I would like to request that the extraneous sheep head be the new censored image. It’s Jason and the Argonauts in space with a timelord Hercules in search of the Cosmic Fleece. This is so a recycled cover for Do Androids Dream of Electric Sheep?. No, it’s John Brunner’s sequel to THE SHEEP LOOK UP. Original title: THE SHEEP LOOKS DOWN, AND SLIGHTLY TO THE RIGHT. The cover artist is just trying to pull the wool over your eyes. Clicked to see what on earth could be hiding under the space sheep. 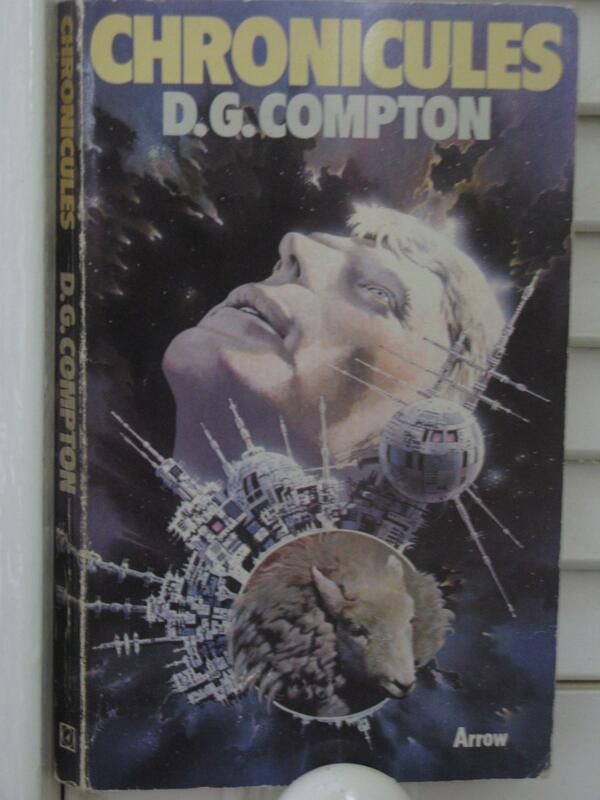 Would’ve been a better cover for The Sheep Look Down While John Brunner Looks Up. Chronicules: just add hot water and stir for a delicious sauce. Goes especially well with lamb. Is this where our beloved Space Sheep first appeared? Gosh! I clicked, wondering how there could be anything under there, and there isn’t. Unknown Artist, we salute you and Space Sheep. I’m such a GSS fan that the first thing I did was click to see what was under the sheep. POV of the cover’s photographer, with appropriate background music. I looked this up on ISFDB and they say the cover artist is one David Bergen. So now we know who to credit for our pal Space Sheep. Mr. Bergen also did the cover for a book called “Manroot” near the end of his SF illustrating career. Hasn’t updated his blog in 5 years, though.